A detailed guide for short term visitors to Spain. Smart advices for accommodation, tours, things to do, shopping and dining. Prepare yourself for seeing a country in which the life is still alive. Spain is such a country that will make you regret for the each minute you wasted by not enjoying the life. Amazing tastes, beautiful beaches, mild weather, joyful people, a deep history and the creativity emanating from the great artifacts are calling you to this wonderland! Spanish people know what the life is better than anyone else. They are passionate, creative and joyful. Living in a country where the great civilizations rose, and the great artists are raised, they are the devotees of history and art. Seizing the day is one of what you will learn from the people of Spain. Spain has a deep history and a deeper culture having been home for many cultures of many civilizations. You may encounter both Roman ruins and pieces of Islamic architecture. You may inhale the historic smells of the streets of Cádiz, the oldest settlement in Europe in Andalucía, or get amazed by the same scenery from the same point with Salvador Dalí in Catalonia. Spanish people know how to taste the life. So, having one of the richest cuisine in the world is not a surprise. Flavors on their palate is important. Magical tapas, amazing paellas or the best seafood ever were created by this passion of taste. Will you be entranced by the first sip of Sangria or will you be feasting on diverse tapas? It’s your choice! Co-founder of Cubism, and co-inventor of Collage, Spain is also known as the homeland of Pablo Picasso born in Malaga, Andalucía. The source of inspiration and creativity, Spain also fed Salvador Dali, the synonym of surrealism. Gaudi, the leader of Catalan modernism, also known as the architect of Barcelona, is another name that Spain is boasting of. When you visit Spain, you will feel you are showered with art, creativity and imagination. Sharing the Iberian Peninsula with Portugal and bounded by both the Mediterranean Sea and the Atlantic Ocean, Spain is on the southwestern part of Europe. If you do not want to regret afterwards, you may want to extend your trip for a few days to see this beautiful part of Spain. Malaga, Granada, Sevilla and the other picturesque cities of Andalucia are the signal flares of Spain calling you to enter. Formentera, Mallorca, Menorca and Ibiza. Balearic Islands are the synonyms of the paradise. If you think that white sand, sparkling water and the dazzling sun are tempting enough, do not leave Spain without being in Balearic Islands. Each island has its own characteristics. You can choose Formentera for a full summer holiday. Need a little tranquility? Menorca is your place. Are you a good dancer? Come to Ibiza. Nature explorer? Mallorca is a hiking heaven. Pick your mode, then pick your island and let it go! Being the country next door, Portugal is worth seeing when you are in Spain. Discover Lisbon the capital, have a romantic trip in Porto or enjoy the golden sand and heavenly blue sea in The Algarve. You are now in the motherland of Flamenco. Let the spirit of this passion emanating from the each corner of the streets surround you. Every corner of Spain from Madrid to Seville offers you a lot of options for shopping. 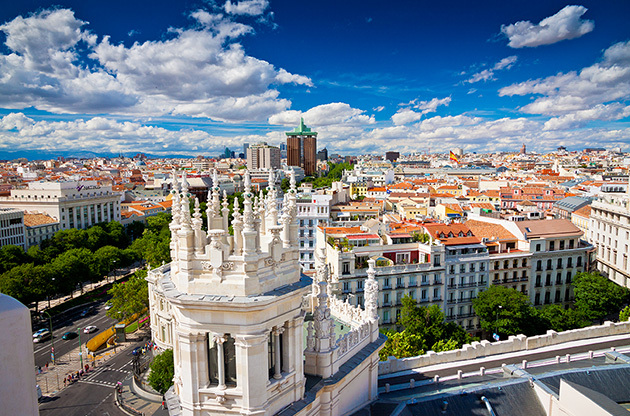 Being especially in Barcelona, Valencia or Madrid means that you are in a shopping oasis. Since most of the major fashion brands are from Spain one more thing to remember is that you are in one of the homelands of fashion. Spanish cuisine will surely shower you with delicious tastes. The most famous dish of Spain, tapas are the name of a wide variety of appetizers. They are usually served with the alcoholic drinks paella for free especially in Andalucía region. Olive oil is the master of Spanish cuisine. It is the main ingredient in almost all the dishes and extra virgin olive oil is the secret of the blessing tastes in this cuisine. Being named after “sangre” meaning blood in Spanish because of its dark red color Sangria is the most popular drink in Spanish cuisine. Being made of red wine, chopped fruits and sweeteners like honey, syrup or sugar, Sangria gives the bliss to whoever drinks it. Spain is a member of Schengen countries so if you have free access to these countries, you will not need to have a Spanish visa. To learn whether you have free access or not, you can check the Ministry of Foreign Affairs' website . transportation network that serves for easy access to everywhere, world class event venues and luxurious hotels with high capacities. Every year, numerous congresses, conferences, fairs, exhibitions, symposiums and tradeshows are held in Spain and they boast making the highly acclaimed organizations.